This is such a cool video: a landscape divided into parallel segments, each recorded at a different time of the day, and thus reflecting changes in light, tone and environmental conditions. Salton Sea Revisited 5m Envelope from Xárene on Vimeo. I don’t know what weather we’ll have today, as I’m writing this in advance, but I have a suggestion or two on making sure you’re not caught off guard, whether you’re heading out for a walk or to the slopes. A weather app came with my phone, and yet the Weather Network’s app is a must-download. Why? Because it’s frightfully easy to use, and it comes ready to roll for every platform. It’s my digital standard. What are the conditions like at Marble Mountain? Or at other major ski resorts in Canada, for that matter? These two apps will be appreciated for ski enthusiasts, who (I know from experience) can get very fretful about tiny changes in the forecast and accumulations. Snow Report is sponsored by trendy retailer The North Face, so be prepared for a sales pitch, and bear in mind that what you read is based on latest filed reports, which means they may not be as up-to-the-instant as you’d like. Unfortunately, Snow Report doesn’t list Marble Mountain, which makes SkiMarble the go-to app for skiers heading to OMJ and other runs. A webcam helps set the scene. I happen to sit about 30 seconds away from CBC’s meteorologist, and yes, I’ll cop to strolling over to ask him specific questions (such as, “My son’s Scout camp this weekend – yay or nay?”). Here’s the thing: Ryan tells his coworkers nothing more than what he tells everyone who subscribes to his Twitter feed, or says on the air. He keeps up with each day’s details, and looks after the whole of the province to boot. What comes after “hey, where did we go?” in the Van Morrison song Brown-Eyed Girl? If you said, “days when the rains came,” you’d do well in one the “finish the lyrics” brain-teaser here on Sporcle, as you race against the clock to get all the right answers. Incidentally, I answered, “days when the rain came” … and got it wrong, until I realized the correct word was the plural, “rains.” Yes, it’s that precise, and that applies for punctuation, too! Check out similar quizzes while you’re here. I was a pretty big comics fan in my day, and that would be the mid-Seventies. If I could rub a couple of dimes together (I remember with horror when comics went from 15 cents to 20, and then – gasp! – to 25), I was picking up the monthly instalment involving someone with a cape and/or mask. My son is submerging himself in comic book culture, spending his allowance (oh, that seems familiar) at the comics shop. I found this for him: a roundup of news about the industry, adaptations for the movies and TV, and miscellaneous threads, many about characters and series he doesn’t yet know or hasn’t yet bought. Hmm… maybe I should set this aside for a while! Want to send your friends to a specific instant in a YouTube video? They won’t have to sit and wait for the first part to pass with this tool. Enter the desired time and the link of the original video, and voila, a new link that will take you right to the marker. John Gushue is a digital editor with CBC News in St. John’s. Twitter: @johngushue. 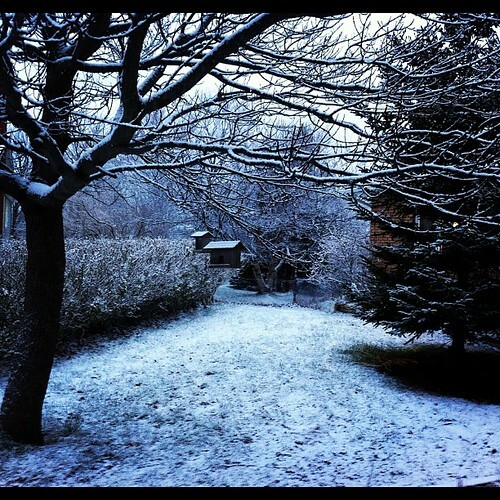 A little bit of snow fell overnight - sugar frosting on the trees, as Martha put it. Enough to make it seem like winter again, and not even close to the amount we'd need to worry about (although the forecast has that possibility looming). From Associated Press, some startling video of the weather yesterday around Lubbock, Texas. Did you survive Juneuary and Fogust? Ryan Snoddon did. 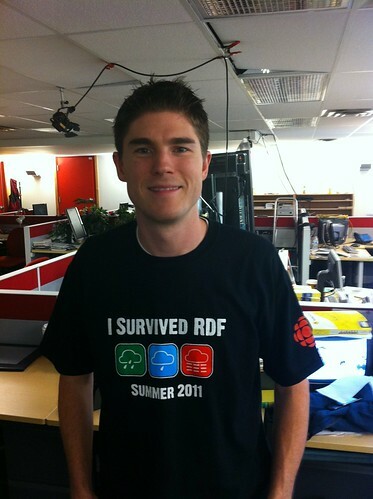 Our meteorologist at CBC St. John's proudly models the T-shirt made to commemorate the epic amount of RDF - rain, drizzle and fog, if you're from away - we had during the "summer." The five-day weather forecast: More fun coming! The weather this month has been dreadful, but I've had fun at work popularizing descriptions of how bad the weather has been. My favourite has been Fogust, which Tom Dunne coined as a hashtag on Twitter with this very tweet. (It's also been used to describe the weather in Tofino, B.C., by the way.) My colleague Jane Adey came up with Augember, another colleague Maggie Gillis gave us Soggust today on the Morning Show, and there's also the very clever Augtober, which I first saw via the Hava Java Twitter feed. While it's always nice to chuckle, it's not so nice to see a forcecast like this, which has rain or at least some precipitation in all but one of the days ahead. The "more fun coming" in the headline to this post, by the way, comes from a bit of black-comedy shorthand that Martha and I have had since it aired in a Codco sketch 20 years ago or so. It stems from one of the "wake of the week" sketches featuring Mary Walsh and Cathy Jones, in which (unable to mourn anyone who has actually died) they head to the hospitals. They looked at the chart of Ricardo Huerta (one of Andy Jones's characters), and ruefully say, "MFC - measure for coffin." When he asks them to repeat that, they glue on smiles and say, too happily, "More fun coming!" Thus, when Martha or I have been having one of those days, we only have to say MFC. The other knows that this would be a great time to suggest, say, going out for dinner. We've been calling it Fogust, Fogtober, Augember ... all to express the idea that the weather so far this month, like much of the summer, has been unseasonably cold. Here's a brief slideshow of the grey weather we've been having. I try to make a screengrab every day of the CBC Newfoundland and Labrador webcam, which is attached to the fourth floor of The Rooms. This gallery also includes a couple of shots of the skies in the city, which have more often than not been overcast or filled with fog. How foggy was it in St. John's today? It was this foggy. Seriously. This is a screen capture from the CBC Newfoundland and Labrador webcam, which is pointed at the Narrows and the downtown area. I grabbed this image around 9:30, I think ... when things are that foggy, you lose track of time. Saturday was, indeed, a gorgeous day. And trust me, the camera today was aimed at all the same buildings and features. Incidentally, up around the Parkway, where our offices at CBC are, the fog was not nearly as pea-soup thick by that point in the morning. More misty than anything else. Nonetheless, my great friend and colleague Cecil Haire took to calling the fog "brutal" this morning as he signed on around 6 a.m., taking in the great fog monster surrounding him. They don't call us Fog City for nothing! I've been trying something over the last little while: Every day, or at least when I can remember to do so, I take a screen capture of webcam that we at CBC have pointed at the harbour. The camera is mounted on the top floor of The Rooms, and looks to the downtown area, the Narrows, Signal Hill and so on. It's been a good period to try this, as there were no leaves when I started, and now things actually look pretty green ... and getting lusher as the days pass. That doesn't mean it's warm, mind you. It's been quite cool, if not near-freezing, lately ... but it's spring, and it's St. John's. I'm, unfortunately, used to it. Here's a slideshow of the work in progress. You can see the collection on my Flickr stream; I hope to keep this going, especially as the seasons change. Spring never comes early to St. John's, but the warm temperatures of the last couple of days - yes, kids could wear shorts without tempting fate - caused the leaves on many trees to pop. I snapped this while we were downtown late this afternoon, near the Anglican Cathedral. Snapped this last week while it was raining. It's no picnic when it rains in St. John's, but it makes picnics possible. Everything is geting very green, even as we wait for the leaves to pop. Colleen Power's song works 365 days of the year for me, but especially during winter, when it's as likely to be about freezing rain as, say, snow. My grandfather was a keen observer of the weather, and during my visits with him, Skipper (as we all called him) had a chestnut or two to share. As I recall, he was the first person to explain to me why a pretty red sunset was great news … especially for a trouting enthusiast like himself. Sailor’s delight at night, sailor’s warning in the morning … those are the things we learn about red skies as kids. But there’s a lot more than that, you know. A weather synopsis that’s worth saving is just the start of this week’s web tour. We’ll also keep you posted with a local eye on the World Cup, pour up some laughs from one of the best comedy troupes in the world, and dish some politics from the right side of the political pew. I downloaded this oversize graphic after thoroughly enjoying the clever way it presented a trove of common-sense information about weather and how we can observe the world around us. Did you ever think it was folk wisdom, for instance, that you could smell a rainstorm in advance? Well, actually, you sort of can; plants release waste when a low-pressure system moves in, meaning that that earthy smell is a sign to take in the laundry. One of the young reporters working with me at the CBC newsroom these days is Andrew Brown (you may remember his dad, Jim Brown, from his years hosting the Morning Show). Andrew is also writing a blog on the World Cup for our sports colleagues. Andrew has been having, from the looks of it, quite the slice keeping track of each day’s action, as seen through the lens of St. John’s fans. The link above is for Andrew’s Twitter feed, which features blog links and more. Speaking of soccer … No doubt the vuvuzela, the contentious instrument that makes a buzzing racket, will be a key memory (good or bad) from this World Cup. Why limit your exposure to just the games? This Dutch company has made a wildly popular – more than 1 million downloads, if you’re curious – app for the iPhone that lets you blare away, whenever you want. Surely this could bring a whole new element to staff meetings, no? I wanted to draw your attention to this interactive map prepared by the U.S. Environmental Response Management Association, which shows the area in the Gulf of Mexico involving the massive Deepwater Horizon spill. Using overlays of data, you can select from many facets, from the infrastructure of the oil industry to the flora and fauna of the area, to industries like the fishery. It’s a great way to get insight into one of the biggest, most complex stories of our time. UCB comes from Upright Citizens Brigade, a comedy troupe that launched Amy Poehler and other funny folks to stardom. The current batch are funny enough; I and many others (a couple of million, actually) have had a jolly good laugh at their take on the BP disaster, which depicted executives at a loss as to respond to a coffee spill. There’s more where that came from. We've had this problem, particularly in our previous house, which had a stairwell leading to the basement door: a wall of snow when you open the door. This photo comes from my wife's friend Gill, and shows what her husband did to make the best of a storm a couple of weeks ago.